After losing friends in the September 11 terrorist attacks on the World Trade Center, Boston-based equities trader Kristie Campbell needed to take a break. The Effingham, Illinois, native found herself in Puerto Rico where she met and fell in love with chef Niall Campbell. The pair planned on moving to San Francisco after marrying, but a detour to a wedding in Kristie's hometown changed their minds. Why, they asked, should they move out West when everything they wanted in a restaurant of their own could be found in Effingham? 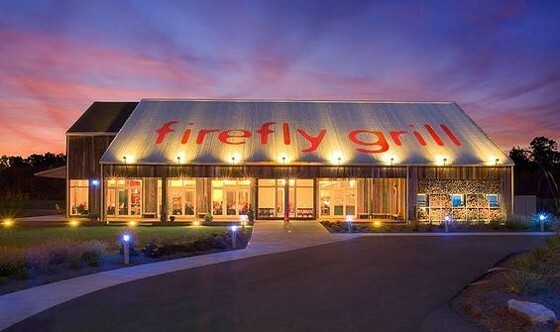 When they received an email from a developer letting them know he had a property that would work for them, they jumped on it and opened Firefly Grill. This was back in 2006, and since then, Firefly has garnered national recognition not only for its excellent food and idyllic setting, but also for its commitment to sustainability. Firefly is roughly 100 miles from St. Louis — close enough for a leisurely day trip but far enough away that you'll feel like you have escaped from the hustle and bustle of the city. Once there, you'll feast on chemical- and pesticide-free food fresh from the Campbells' garden or sourced from small producers. It's worth the trip to see a place where farm-to-table is more than just a buzzword. 1810 Avenue of Mid-America, Effingham, Illinois, 62401. 217-342-2002, www.ffgrill.com.